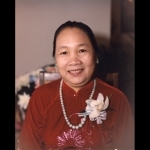 Elizabeth Lo Hoang, 81, of Overland Park, KS, passed away Thursday, May 31, 2018. Visitation will be from 6:00-9:00 PM with a prayer service at 7:00 PM Thursday and Friday, June 7-8, at the Porter Funeral Home, 8535 Monrovia St, Lenexa, KS. Mass of Catholic Burial will be 9:30 AM Saturday, June 9, at Curé of Ars, 9405 Mission Rd, Leawood, KS. Burial in Resurrection Cemetery. Elizabeth was born on January 15, 1937, in Quang Tri, Vietnam, to Chot & Huong Hoang. She is survived by her husband of 57 years, Peter Kien Nguyen, and her 10 children, from eldest to youngest: Kim Hien Nguyen, husband Truc Vo & children; Kimberly Hue Hoang, husband John Khanh Hoang & children; Paul Nhuan Nguyen, wife Thuy Thu Vu & children; Tony Khiem Nguyen, wife Ha Ly Nguyen & children; Phillip Phuc Nguyen, wife Marina Loan Kim Nguyen & children; Cynthia Phuong Nguyen, husband Scott Alexander & children; Dieu Dave Nguyen, wife Tien Pham Thuy Nguyen & children; Skye Hang Nguyen, husband Luis Rodriguez & children; Alex Hieu Nguyen, wife Nhu Quynh Nguyen & children; Thuy Kieu Hohn and husband Justin Hohn. Elizabeth also reveled in the love of 24 grandchildren and their spouses: Ngoc Yen Vo & Dung C Luong, Linh Vo & Chris Smith, Bao & Duy Vo, LanAnh & Nam Thanh Phan, Anh My Hoang, Kathleen Ngoc Anh Hoang, Margaret Phuong Anh Hoang, Kayla Quynh Nguyen, Asia Huong Nguyen, Jordan Paul Nguyen, Jacobe Thien Nguyen, Markis Trung Nguyen, Ethan Toan Nguyen, Ella Thuy Tran Nguyen, Vincent Duy Nguyen, Vivian Quynh-Nhi Nguyen, Valine Quynh-Van Nguyen, Annabelle Thien An Nguyen, Daniel Thien Duc Nguyen, Nicolas Hai Rodriguez, Lucas Long Rodriguez, Olivia Ngoc Quynh Nguyen, Grace Hai Vy Nguyen, Evelyn Hai Au Nguyen; and great-grandchild Aaron Quoc Hung Vo. Google Map: Click Here to see Location on Map.